The Final Report of the UK's Independent Commission on Banking (ICB) has recommended very significant changes to the UK banking industry. These include a structural ring-fence of retail banking activities and additional requirements on the issuance of equity and debt with loss-absorbing features, in particular requiring banks to issue a minimum amount of bail-in debt. Initial indications are that the UK government is likely to implement all or most of the recommendations. 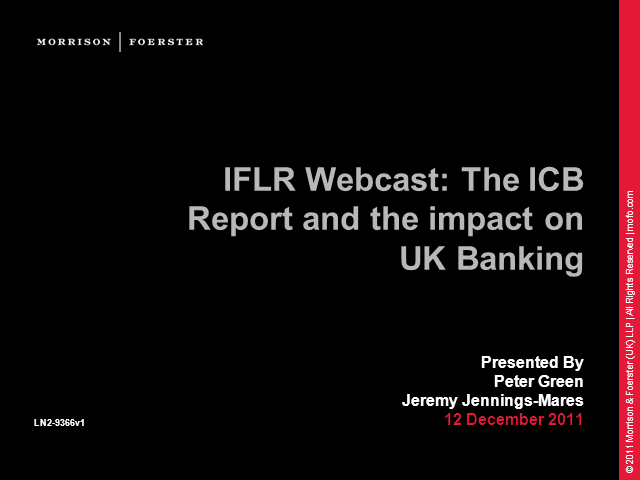 Speakers will discuss the impact of such changes, including the likely restructuring that will be required of UK banks, the impact on how banks fund themselves including in the wholesale markets, the effect on the competitive position of UK banks against other international banks and the interaction of the proposals with other European and global initiatives including the Volcker rule in the US.